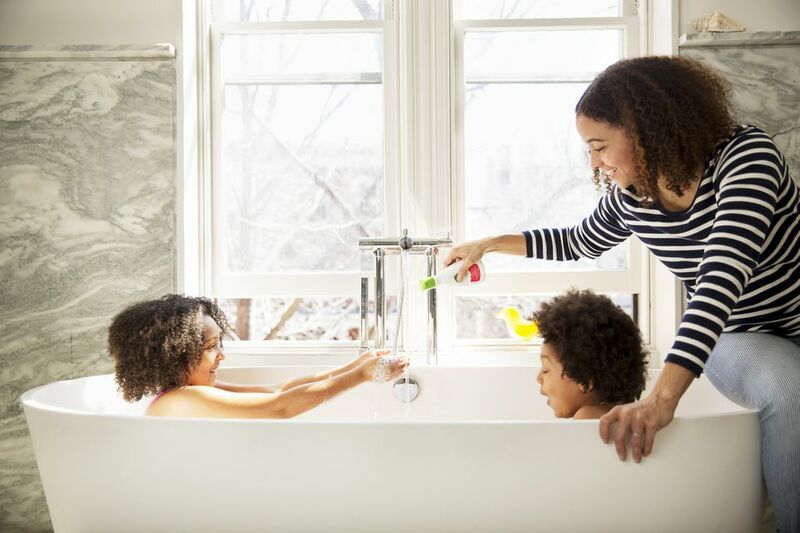 To help you find the perfect bathtub, we took a closer look at some of the most popular models on the market, including those specifically designed for babies, toddlers, and adults. If you're ready to start shopping, here are the top-rated bathtubs that impressed us the most. American Standards sets, well, the standard when it comes to trusted tubs, and this model is no exception. The 5-foot bathtub is simple in design, and come with a left-hand drain outlet. It has a glossy porcelain finish, but the surface is coated in a slip-resistant material to help prevent accidents. The 32-inch-wide tub is made of americast material, which promises to be lighter and more durable than tubs made of cast iron. It’s also made for easy installation with an integral apron (i.e. the side of the tub you see is ready to go out of the box). Customers give this tub high marks, and many note that it’s deeper (17 inches) than many standard tubs, which allows of soothing soaking. Talk about a tub that makes a statement. This one from Heisenberg is not only claw-footed (swoon! ), but it’s also made of hammered antique copper for a dreamy look and feel. It stands alone and measures 67.5 x 32 inches overall, with a soaking depth of 15 inches. You don’t have to worry about it turning green either, as it’s coated with a lacquer to ensure it stays looking great. Customers love the look and say it makes a stylish addition to the bath, and that installation is simple. They also note that it’s comfortable, and the size is great, providing enough room for even tall people to stretch out. Ready your bath salts, this tub from American Standard is built for some serious soaking. It has an extra deep bath well, and it measures 66" x 42" x 23" overall. It’s a freestanding tub too, which not only makes a sleek, stylish statement in your bath, but it also allows for more flexibility when it comes to placing the faucets and other fixtures. This tub comes complete with the faucet, a hand sprayer and drain as well as a limited lifetime time warranty. Customers say it makes for extremely comfortable bathing, it’s easy to install, and it’s a great price, especially given everything that’s included. They also note that it’s beautifully designed and brings a bathroom to life. Splish, splash, baby is taking a bath. When it comes to bathing babies, it’s a lot easier and safer to do when they have a tub made just for them. This award-winning baby bathtub earns top marks from parents who say it’s simple to use and makes bath time a breeze. When kids outgrow the baby bath tub, but they’re not quite ready to dive into the full-sized tub, a toddler tub provides a great transition. This one from Munchkin makes an excellent choice. The inflatable duck is designed for kids up to 2 years, and it can be used in a bathtub or on any flat surface. The bottom is textured to help prevent baby from slipping around too. Easy to inflate and deflate, it’s great for travel and easily fits into a diaper bag or your suitcase. Beyond being ridiculously cute and the perfect backdrop for adorable baby bath photos, parents say this tub is comfortable for kids, and the price can’t be beat. Some have found uses for it beyond bathing too, such as an inflatable toy for pools and lakes and as a playroom toy when filled with plastic balls. For a rectangular tub that’s anything but basic, there’s this one from Kohler. It measures 60" x 32" x 19", and it boasts a molded lumbar arch support to make for comfortable soaking. The bottom is textured to prevent slipping, so there’s no need for mats that can get moldy, and it has low step-over height to make getting in and out of the tub easy. 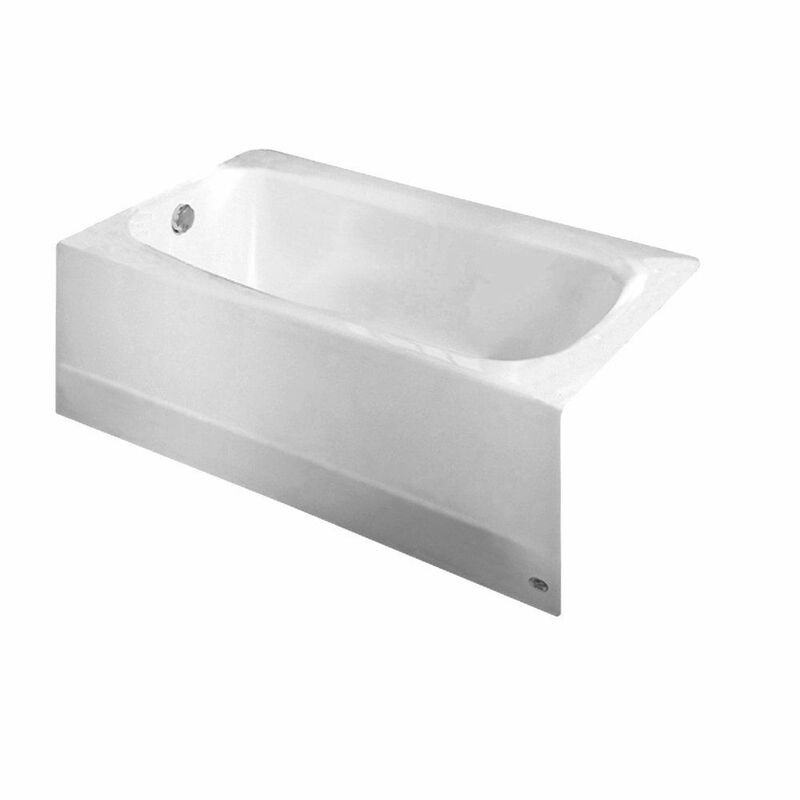 Customers say the tub is nice and deep and makes for excellent soaking, and they like its clean, sleek lines. Some caution, however, that extra close attention should be paid to the width of the tub as some have had problems with it fitting in their space. Sometimes it’s hip to be square, and we’d say that’s definitely the case with this bathtub from Kohler. It measures 48 x 48 inches and offers a sleek, contemporary look that will let you soak in style. Two raised corner seats are built in, and it’s extra deep for a Japanese-style experience. From trusted bath manufacturer, Kohler, it’s well made and built to last. You will need to make sure you have the space for this luxurious tub, but if it will fit, it can add an amazing element of relaxation to your bath. There are no hard lines or sharp angles here. This round bathtub from Maykee is all about smooth, circular flow. Modern and sleek, it will make a major stylish splash in your bath, and it’s built for comfort too. It’s made of an acrylic material that’s designed to warm up quickly and stay warm. It measures 53 inches in diameter, so it’s big enough to sprawl out in or share with someone else, and it’s more than 24 inches deep. The filler and faucet are sold separately, but a drain kit is included. Lightweight, it's simple to install, and it comes with a limited one-year warranty. Our writers spent 5 hours researching the most popular bathtubs on the market. Before making their final recommendations, they considered 25 different bathtubs overall, screened options from 15 different brands and manufacturers and read over 150 user reviews (both positive and negative). All of this research adds up to recommendations you can trust.